Located in Ramona, California, in the heart of San Diego. We offer a complete line of trailers including aluminum, steel, and combination trailers including horse trailers, stock trailers, cargo trailers, motorcycle trailers, car hauler, dump and utility trailers. We also offer toy haulers, vending and living quarters trailers in either standard or custom designs. Our central location within San Diego County makes us easy to find. 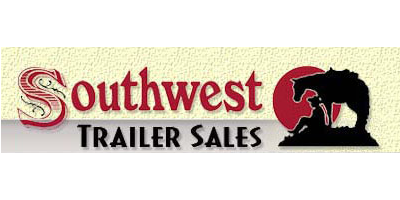 Southwest Trailer Sales is a full service dealership that sells, finances and services both new and used trailers. We also have a large parts and accessories department. Our knowledgeable staff can provide routine service or custom fabrication for your existing or future trailer. Through a dedication to customer service, more than half of our sales are outside San Diego County. We can provide nationwide delivery and are expert at deliveries to Mexico and Hawaii. We are owned and operated by people who use the products they represent. It is our goal to make your experience with us enjoyable, informative, and rewarding. Let us help make your trailer dreams become a reality. Whether you're a first-time buyer or have been towing for years, we appreciate the opportunity to serve you. If you don't see what you want, we can get it or design it! Just contact us by phone or email -- or request a free product brochure of your choice. Check out our Bargain Corral to see our latest deals. Southwest Trailer Sales is a family owned business that was started with horse trailer sales in Ramona, California in 1996 by Patrick & Jeanine Lyons. Our inventory includes new and used horse trailers, cargo trailers, utility trailers, flatbed and dump trailers, and living quarters trailers. We have grown from a small office on a tiny lot to a 2-acre facility with over $1 million in inventory and an expanded parts and accessories department. Due to tremendous hard work and loyal customers, Southwest Trailer Sales has won numerous awards and escalated to a nationwide Top 10 dealership. Southwest Trailer Sales specializes in custom built trailers of all types and services all brands of trailers. Our business hours are Tuesday through Saturday, 9am to 5pm, and we are closed on Sunday and Monday. Give us a call at 760-788-8900 today! While using our professional knowledge to educate our customers, our main objectives are to provide each and every customer courteous, honest and friendly service, together with very fair and competitive prices.